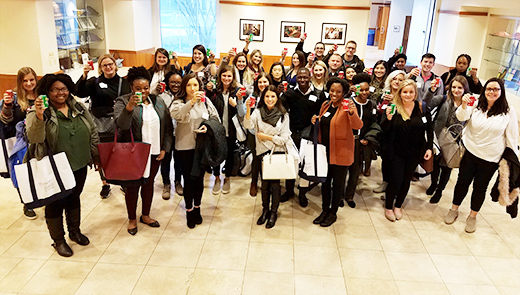 InEmory ABSN students participate in the traditional Coke Toast at the Nell Hodgson Woodruff School of Nursing. The first cohort of 34 InEmory ABSN (Accelerated Bachelor of Science in Nursing) students arrived on campus January 11, participating in orientation activities throughout the day. Emory Healthcare, Georgia’s top-ranked health care system, and the Nell Hodgson Woodruff School of Nursing, launched this ABSN program aiming to provide a seamless education to practice pathway for students wanting to transition from a nationally ranked nursing program into practice in a Magnet® designated hospital in Atlanta, GA. Many come to the program from different educational backgrounds, including those with prior degrees in pharmaceutical chemistry, law, political science and business. Members of this cohort have worked in an array of fields including real estate, graphic design and AmeriCorps. The InEmory ABSN program option for second-degree students gives students the opportunity to learn from nationally-renowned nursing faculty at Emory University while being immersed in clinical rotations focused in the Emory Healthcare system. Students will be hired by Emory Healthcare to serve in the critical shortage area of advanced medical surgical nursing in its hospital system following graduation and successful completion of licensure examinations. Spring Semester begins on Monday, January 14. The next deadline for applications to the InEmory ABSN program is June 1, 2019. To apply to this program, please visit nursing.emory.edu.